The syntax InvoiceController as invoice tells Angular to instantiate the controller and save it in the variable invoice in the current scope. Ok , so I wont have the parameter $scope in my controller and the code will be much cleaner in the controller. What is the goal of doing it ? removing from one place and add to another place ? I will be glad to see what am I missing. There are several things about it. Some people don't like the $scope syntax (don't ask me why). They say that they could just use this. That was one of the goals. Making it clear where a property comes from is really useful too. You can nest controllers and when reading the html it is pretty clear where every property comes. You can also avoid some of the dot rule problems. You can modify both parent and child, no problem about that. But you need to use $parent to see the parent's name, because you shadowed it in your child controller. In massive html code $parent could be problematic, you don't know where that name comes from. Same example, but it is much much clearer to read. The main advantage with controller as syntax I see is that you can work with controllers as classes, not just some $scope-decorating functions, and take advantage of inheritence. I often run into a situation when there's a functionality which is very similar to a number of controllers, and the most obvious thing to do is to create a BaseController class and inherit from it. Even though there's is $scope inheritence, which partially solves this problem, some folks prefer to write code in a more OOP manner, which in my opinion, makes the code easier to reason about and test. I believe one particular advantage is clear when you have nested scopes. It will now be completely clear exactly what scope a property reference comes from. Ofcourse we can use another name than “vm” in the controller as syntax. 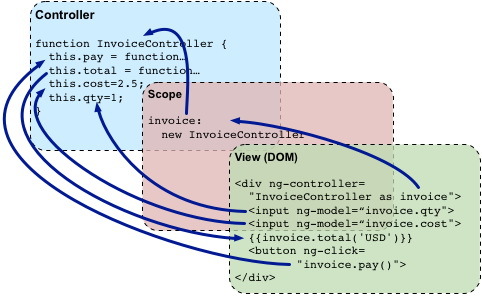 Under the hood, AngularJS creates the $scope object and attaches the properties and behaviour. However by using the controller as syntax, the code is very clean at the controller and only the alias name is visible on the view. Create a controller without $scope object. Assign this to a local variable. I preferred variable name as vm, you can choose any name of your choice. Attach data and behaviour to the vm variable. On the view, give an alias to the controller using the controller as syntax. You can give any name to the alias. I prefer to use vm unless I’m not working with nested controllers. I find the main advantage is a more intuitive api since the methods/properties are associated with the controller instance directly and not the scope object. Basically, with the old approach, the controller becomes just a decorate for building up the scope object. From what I've read, $scope will be removed in Angular 2.0, or at least how we view the use of $scope. It might be good to start using controller as as the release of 2.0 nears. Video link here for more discussion on it. How to get AngularJS alias controller name? What can be the reason to use “controllerAs” property? Why alias is used for ng-controller in Angular?